Devon Prep golfer Ryan McCabe shot a 4-over par 76 to finish tied for third in the PIAA Class 2A East Regional on Monday. 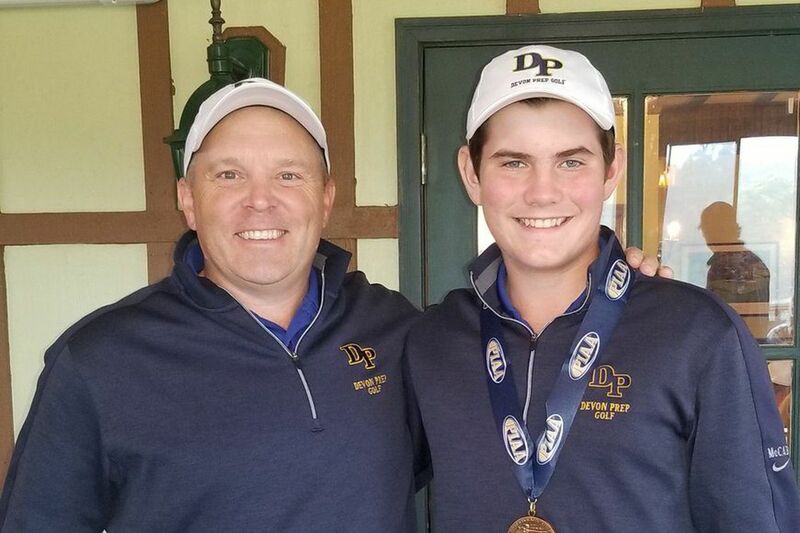 Devon Prep golfer Ryan McCabe qualified for the PIAA Individual Championships for the second straight year on Monday. McCabe shot a 4-over par 76 to finish tied for third in the Class 2A East Regional at Golden Oaks Golf Club in Fleetwood. McCabe finished 15th in last year's state tournament. William Mirams of Notre Dame East Stroudsburg finished first at 2-over par. The indiviudal championships will take place next Monday and Tuesday at Heritage Hills Golf Resort in York. In the Class 3A East Regional, Council Rock South's Matt Fleming and Central Bucks East's Patrick Sheehan tied for second at 1-under par 71. Carson Bacha of Central York won with a 3-under-par 69. A total of 13 local golfers qualified for next week's state championships. Jade Gu of Pennsbury shot a 1-under par 71 to win the Class 3A East Regional. West Chester East's Victoria Kim (73) and Downingtown East's Liddie McCook (77) took second and third, respectively. Ricshya Walker recorded a hat trick in Franklin Learning Center's 3-2 win over Kensington. Filip Barun and Gibreel Mami scored in Harriton's 2-1 victory over Penncrest. Barun also had an assist. Sara Biunno had two goals as Cardinal O'Hara defeated Bonner-Prendergast, 6-0, in the first round of the Catholic League playoffs. In the other Catholic League play-in game, freshman Amanda Armstrong scored two goals to send Hallahan past St. Hubert, 2-1. Maggie Forbes netted two goals as Strath Haven held off Springfield (Delco), 2-1. Danielle McNeely assisted on both goals for the Panthers, who improved to 13-2-1 overall and 8-1-1 in Central League action. Alyssa Wert's goal in the second overtime period lifted Garnet Valley past Radnor, 1-0. Masterman defeated Philadelphia Academy Charter, 2-0, thanks to goals from Aden Gonzales and Razan Osman. Izzy Jacobson ended with two goals as Barrack Hebrew took down New Foundations Charter, 3-1. Pope John Paul II received goals from Amaya Ransom and Mary Kate Shannon in a 2-1 triumph over Upper Perkiomen. Alex Almonte and Maeve Riehman had two goals apiece in Archbishop Carroll's 9-1 rout of Archbishop Ryan. Grace Ball had two goals in Wissahickon's 2-0 victory over Upper Moreland. Central's Maddie Mast picked up her 68th career victory as the Lancers beat Girls High, 5-0, in the Public League Class 3A final. Mast's 68 combined wins between singles and doubles is a school record. Central will play Masterman, a 5-0 winner over Bodine, for the overall Public League title. Downingtown West's Aly Reardon reached 1,000 career kills in the Whippets' 3-0 win over West Chester Henderson. The first round of the Catholic League boys' soccer playoffs will take place on Tuesday. Elsewhere in boys' soccer, the Pioneer Athletic Conference semifinals are on tap. Girls' soccer and field hockey also enter the PAC semifinals.